No you can’t, I tried. Now this thing was starting to assume enormous proportions. You know the kid who stamps her feet, goes purple in the face and yells: “I WANT ONE!!!!!!”? That was me. I had five minutes lying down in a darkened room and returned to the fray. Helix is a British company, so I phoned them up and asked why I couldn’t get one in the UK. I KNOW THAT! Apparently, they are made in the Far East and all go directly to the USA and can only be bought there. Damn! I mean, why should America be the only place in the world that has perfect circles? And British ones at that. So I updated my progress, or lack thereof, on FB and a very nice lady in the States said she would see if she could get one and send it to me. Wow, that’s nice. And, cutting the story shortish, she got back in touch for my address and sent it off to me. In return, I asked for her address and the costs and how she wanted the money sending to her. No money, she said, send me a piece of your artwork. Oh come on, honey, it may not have been expensive but it’s worth more than that. But no, she was adamant, just a piece of artwork would be fine. Now if that doesn’t restore your faith in human nature and the kindness of others, I don’t know what will. So ever since she said she had sent it, I’ve been waiting for the postman. (Singing along with the Carpenters in my head, of course.) Rather exciting, expecting a letter from America, quite exotic. It came this morning. I haven’t tried it yet but I can’t wait. 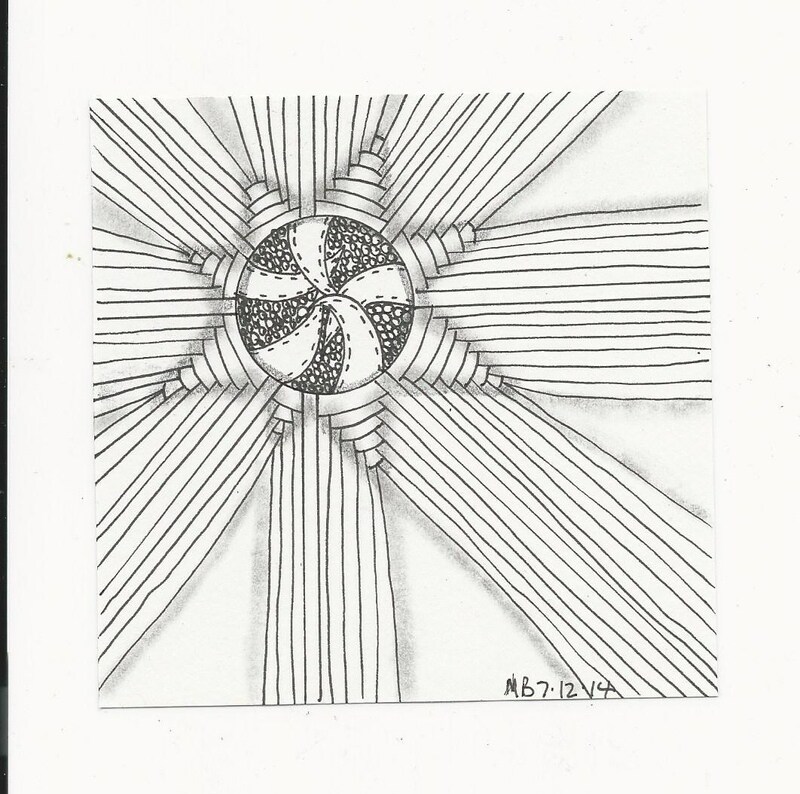 And, fortuitously, this week’s Diva Challenge is to use a pattern called Arukas, which requires circles. Bet my circles are better than yours! And what did I come up with? Life has its ups and downs, so along the way, Make friends, Live, Love, Laugh, Be Happy. Only when it was almost finished did I realise the second half was a direct quote from “When the red, red robin..” There’s bathos, for sure. Promarker pens for the “ground” and the usual microns for the detail. 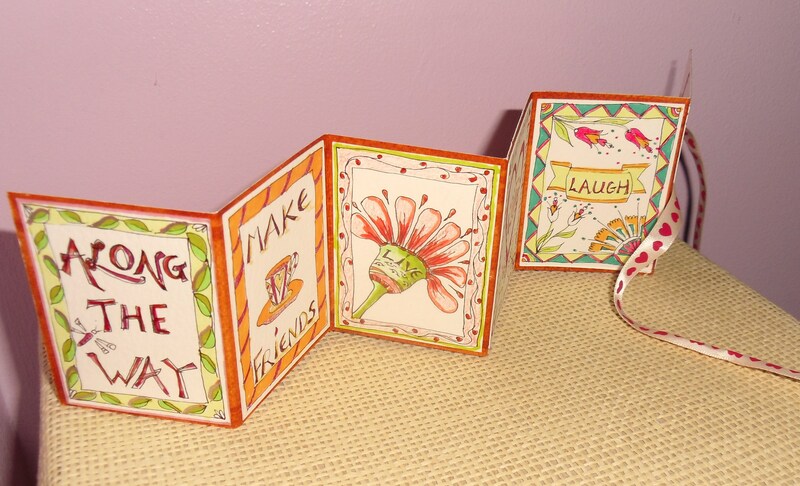 Each little panel has a word or phrase within it. And I’ve been busy with other things too. 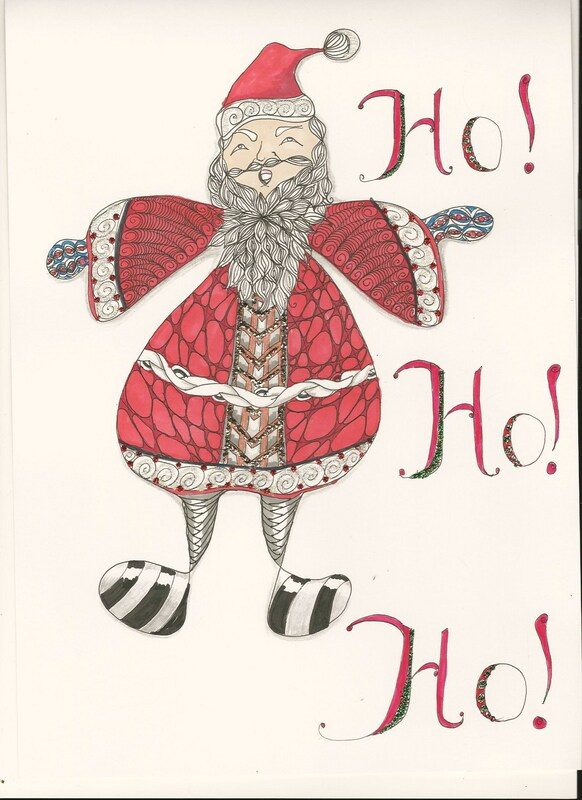 I did a jolly Father Christmas based on something I saw on last week’s Diva Challenge. http://tanglemania.blogspot.co.uk/2014/12/rag-doll.html and this led me to another site, with a video containing all sorts of Tangle ideas, one of which was to draw these figures. https://www.youtube.com/watch?v=3VHqjKhWWqA Good fun, i thought. you can’t see it on the scan but there is twinkly glitter here and there too. 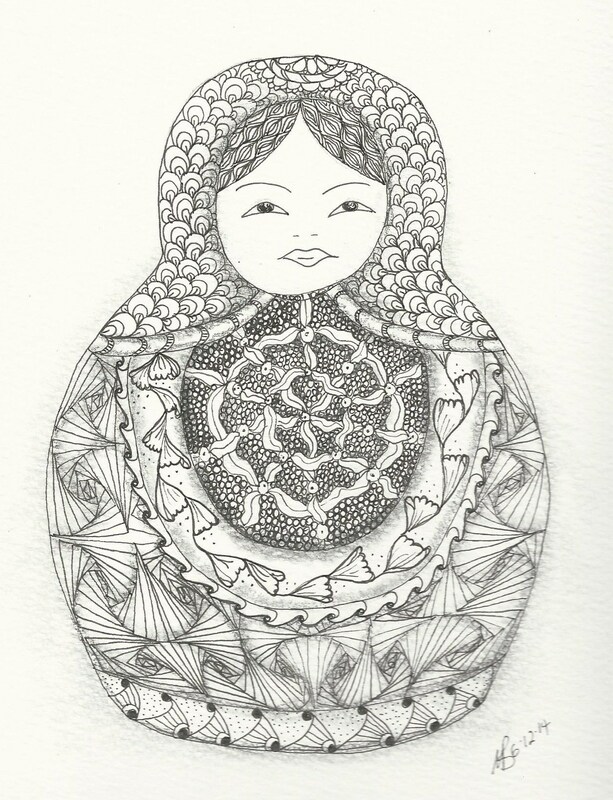 And I did a matryoshka doll too. I have not yet coloured it, but I may. Quite a big piece, bigger than A4, so quite a challenge after the little tiles and Christmas cards. 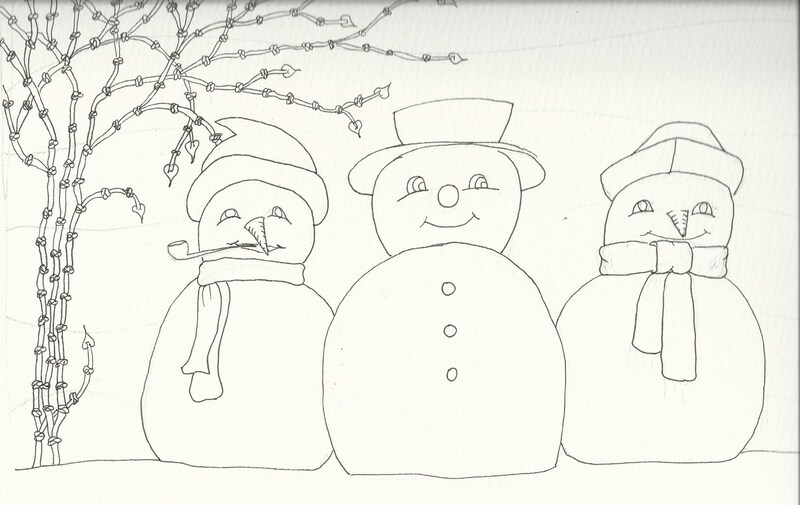 And, almost finally, my current work in progress: for my grandson, Ben, who, I hope, likes snowmen. Just waiting to be tangled – I think I’m going to enjoy these. 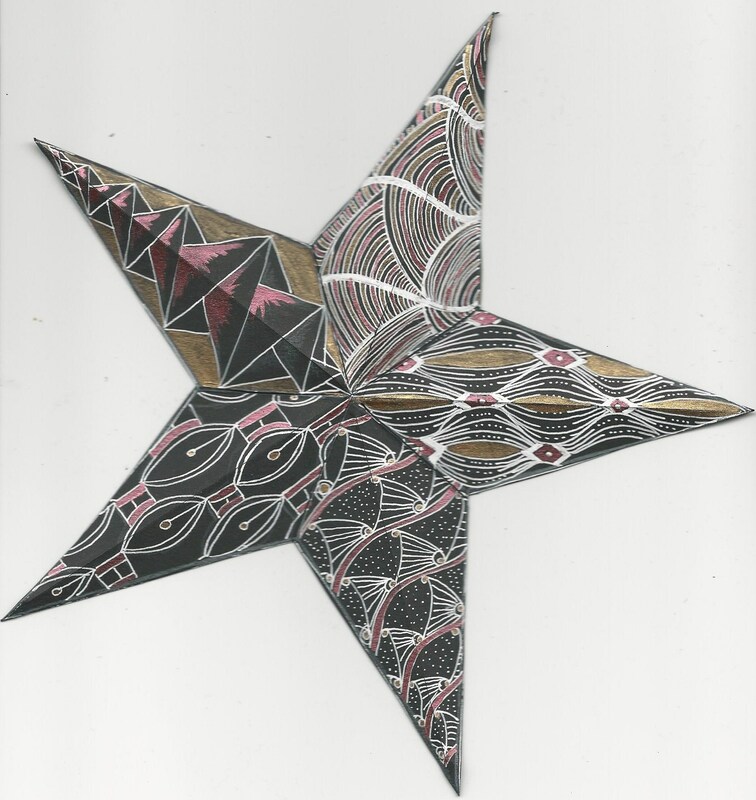 So, finally, this week’s Diva Challenge – I like this pattern so I’ve already tried three or four different ways with it. And, oddly, although the first circle, drawn with my new toy, is, like Mary Poppins, practically perfect in every way, the outer ones, drawn freehand, can’t quite maintain the standard. 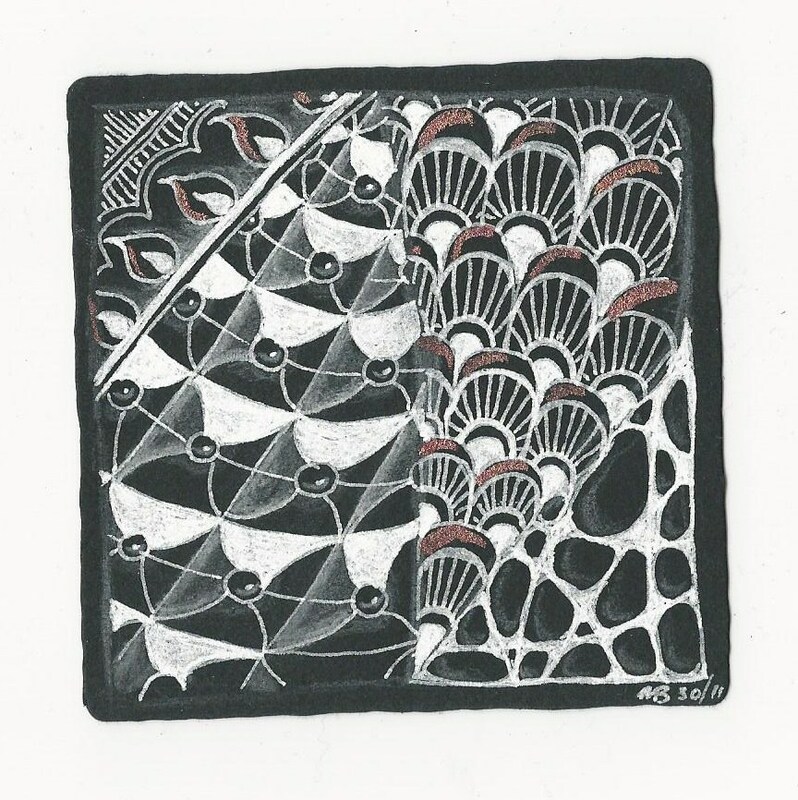 When my mum did her embroideries – see my stitch gallery for some of her work- she used to make occasional mistakes and always said that was what made it hers and hers alone. She could have been a Zentangler! This pattern looks simple but needs a steadier hand than mine to get it just right. however, I was amazed how much better it looked with shading. 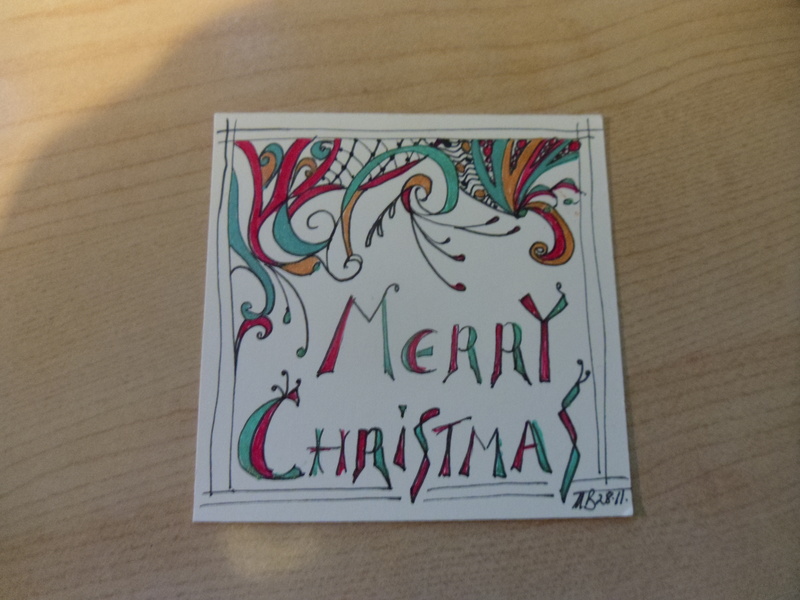 This is just the topper ready to go on the card, extensively borrowed from Joanne Fink. 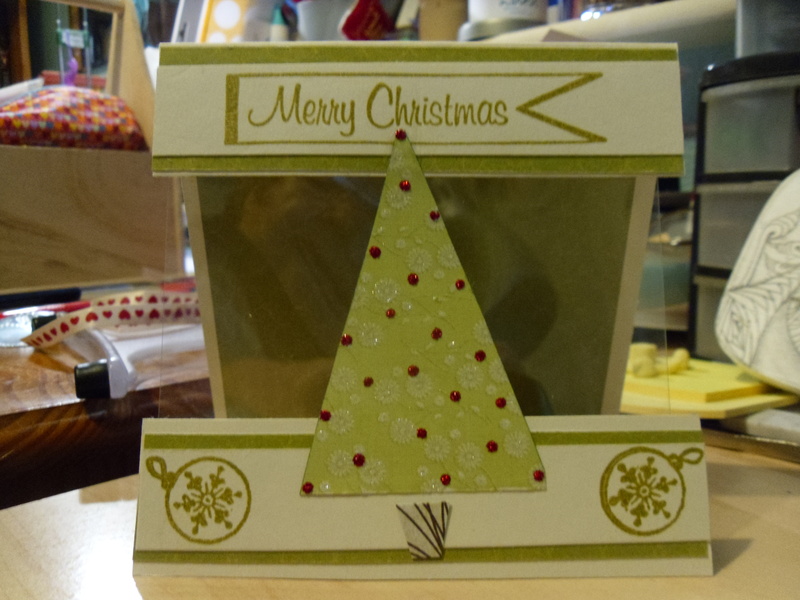 Based on an idea in my craft class, where we did a card using three trees to hold top and bottom of the front together. On this one I backed the tree with acetate to give it a bit of strength. These two were both from craft class. Very simple but, I think, effective. A couple of friends came round the other day and one of them brought me some boxes to decorate if I wanted to. Here’s the lid of the first one. It’s about five inches square. 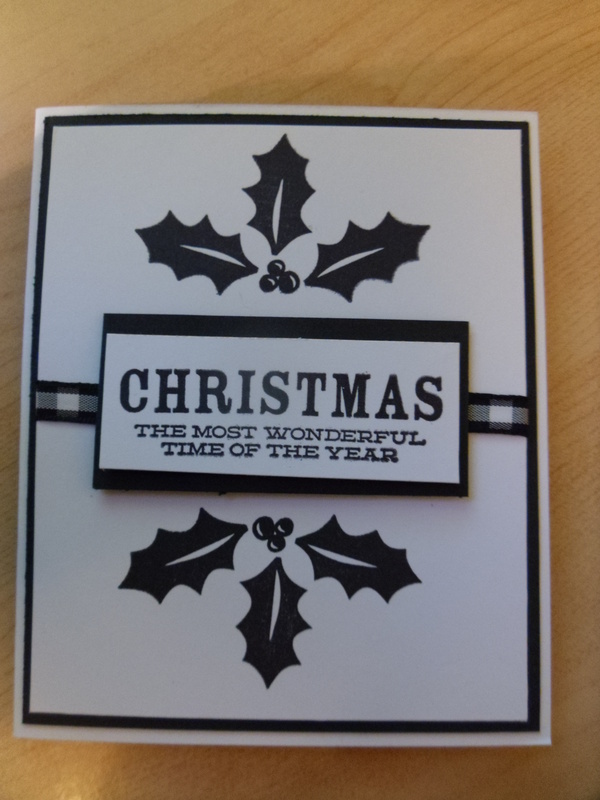 However, I have started another project for Christmas, although it may not be ready for THIS Christmas, but we can hope. It’s based on a photo I saw on Facebook of a picture by a lady called Diane Vienneau. Isn’t it great? So I thought I’d try one. I’ve messaged her on FB to ask if she minds my sharing her work on here and she says OK, so I know she won’t mind and I just want to share her wonderful work. I’ve only got as far as the main outline plan. 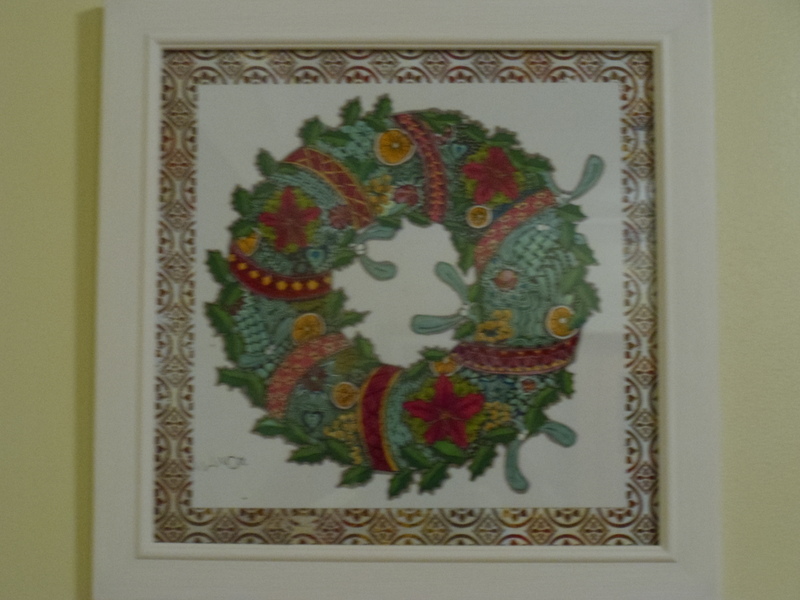 And this is the finished version, framed and done. Not a patch on the original, I admit, but it’s probably one of the best things I’ve done so it deserves its place on the dining room wall. Main features in place and then some alcohol markers to colour a general background. 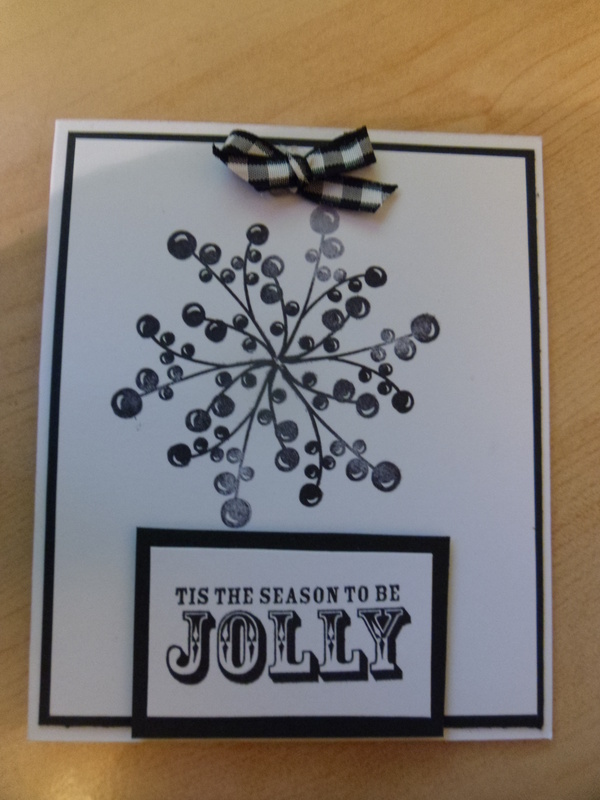 I’ll use Gelly Roll pens to fill in the rest and add detail, plus some sparkle and Liquid Pearls. You can see all my scribbling on the left hand side, where I noted ideas before I forgot. If it’s good enough, it may even go on the wall. 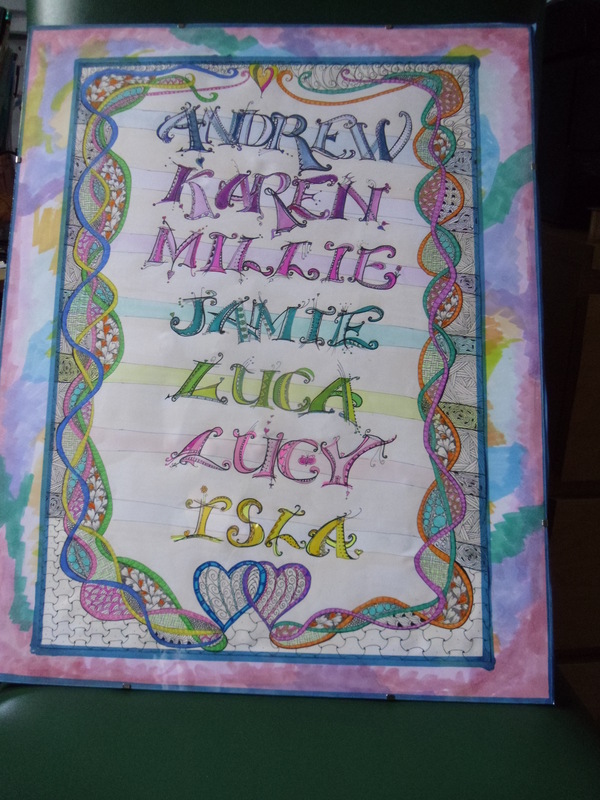 Speaking of “if it’s good enough…” I started a big name plate thing for my son and his family some time ago, using Joanne Fink monogram patterns and a Zentangle border. I’ve worked on it on and off for months but lost interest and have just finished it in time to give it for Christmas. It’s wrapped and ready and yet, and yet. Alright, I’ll ‘fess up, I don’t want it to be one of those things they put on the wall if they know I’ll be coming round, just to please me. (Bloody vanity – I should be grateful they care enough not to want to hurt my feelings.) Well, this is it in its finished form and I won’t be there to see them open it, so I’ll never know, will I? So many ways I could have done it better. 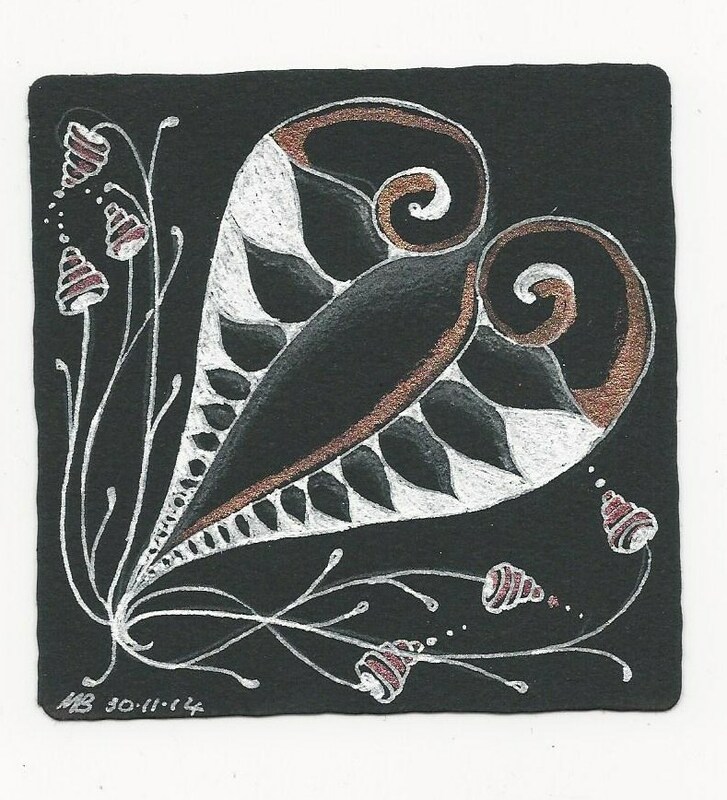 I have a Zentangle class tomorrow and am looking forward to it. 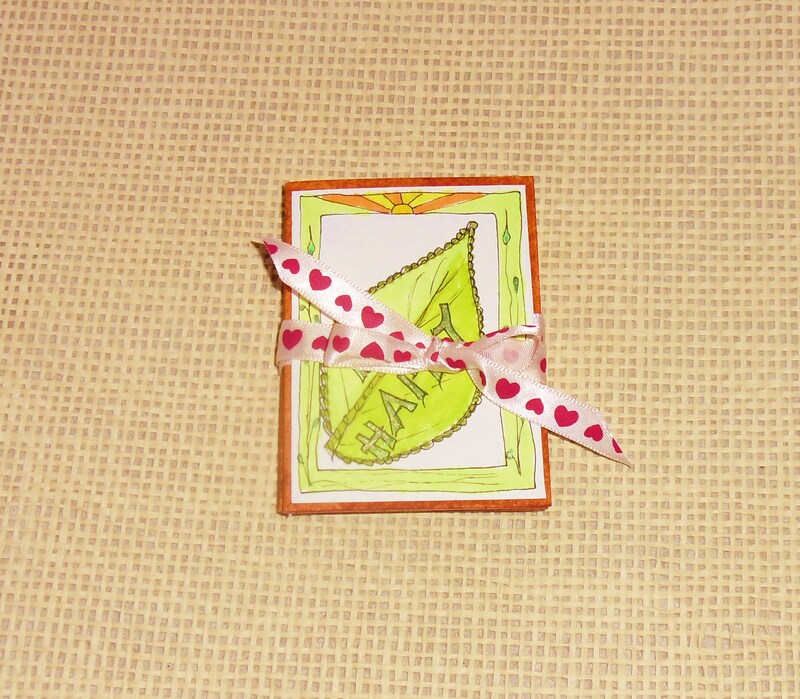 At the last one, we drew a leaf, divided it into sections and started filling it with patterns. For homework – homework, would you believe? 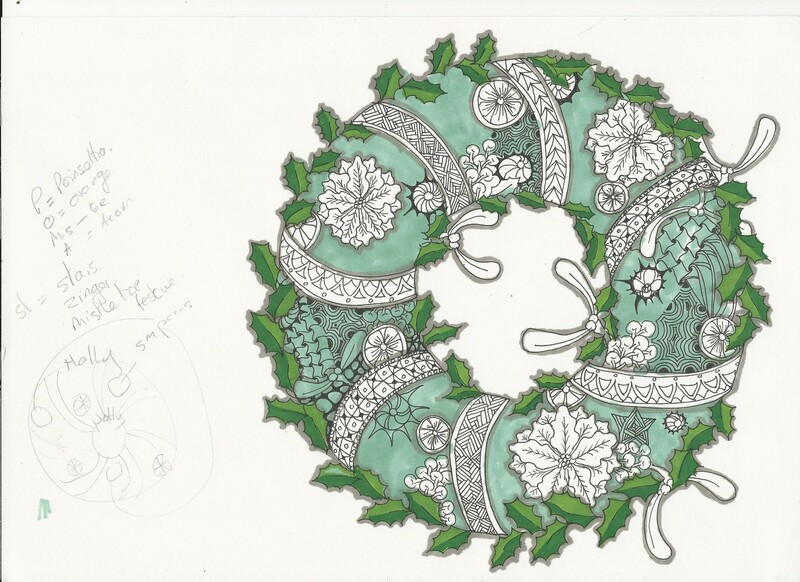 – we were to finish the patterns and take it back tomorrow to do a sort of background or frame. So this is what it looks like today and we’ll see how different it is tomorrow. In my eyes the veins in the leaves are too thick but I can fill them with patterns too, maybe. 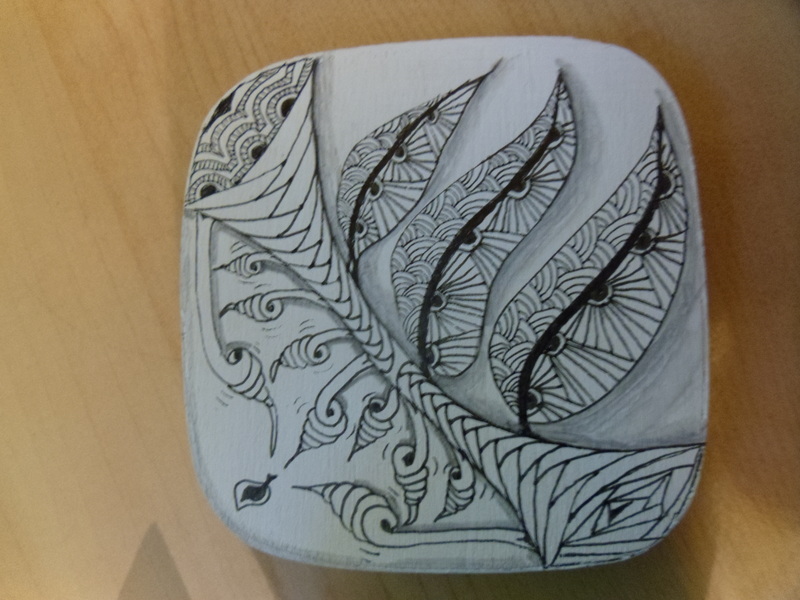 Been to my Zentangle class. Was it great? Oh yes it certainly was. We did white on black, which was not a complete success but I do feel I learned a lot. 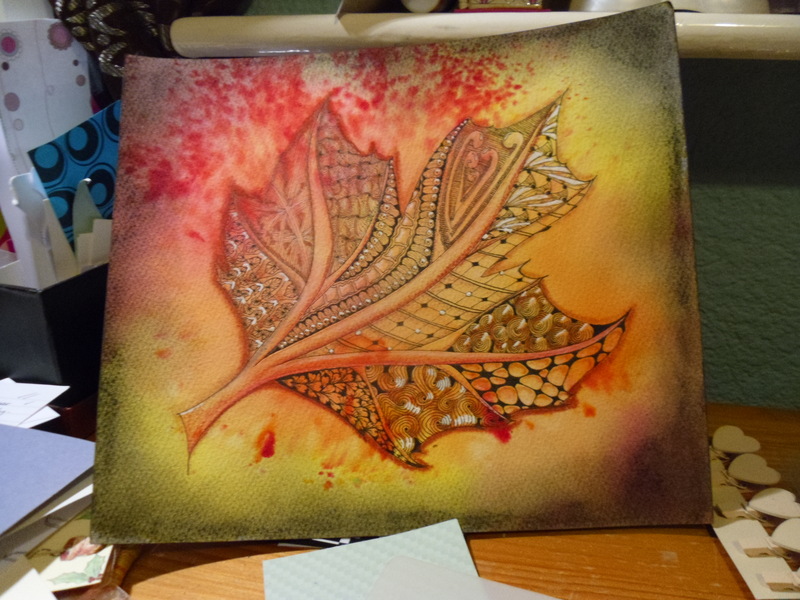 See above for the virtually finished leaf and then we did two tiles, see below, and a Christmas Star, using mica powder to colour. It’s much more luminous in reality than it looks here but you get the idea. That’s mica powder added to my Christmas list. And a new pattern here but can’t remember what it’s called. Three new patterns tried here but I’ve forgotten their names already. Durr! Really loved doing this one. The white on black is tricky because of the way the ink goes on and shading is sort of in reverse, but not. Yes, well, that’s as clear as I can make it, so we’ll leave it there. And finally, the Diva Challege. We were asked to use a doll as our string and I have to admit the first thing that came into my mind was Chocky. ( Sorry, apparently it was Chucky! 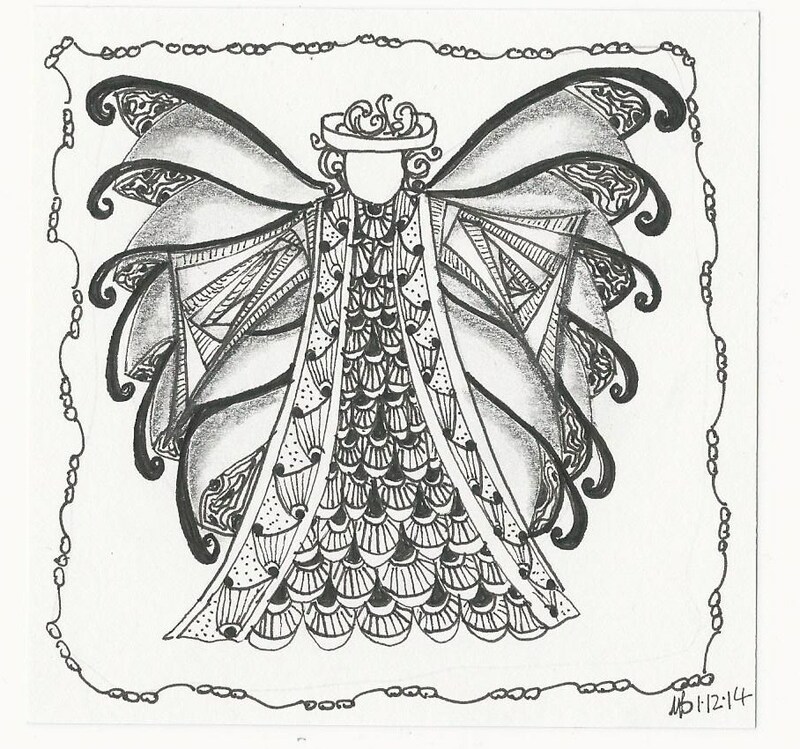 )I trod temptation under foot, however, and ended up with an angel doll. Now I admit, she/he still looks more like an avenging angel than a guardian one but we are, after all, what we are.